Despite a steady increase in the number and diversity of African Middle Pliocene hominin fossils, paleoanthropolo-gists are not now substantially closer to understanding the temporal, geographical or ecological contexts of the origin of the Homo clade than was the case in 1964, when Louis Leakey, Phillip Tobias and John Napier introduced Homo habilis as the earliest species of the human genus. The reasons for this circumstance are several. The fi rst is a still data-poor record in the relevant time periods. Although the half-million year interval between 2.5 and 3 Ma witnessed heightened morphological, taxonomic and diet-driven adaptive diversity in extinct hominins, all of the known taxa from this interval are of australopith grade (i.e., Australopithecus africanus, A. garhi, A. aethiopicus, late A. afarensis) and none shares derived morphological characteristics exclusively with geologically younger, securely attributed representatives of the Homo lineage. A few specimens that at one time or another have been attributed to Homo fall in the time period 2.5–2.0 Ma but most of these are fragmentary and/or of questionable (or at least debated) diagnostic value (see discussion below). The earliest well-sampled record of fossil hominins that bear characters found only in the genus Homo date to ca. 1.7–1.8 Ma. The fact that as many as three species with unique ties to Homo (H. habilis, H. rudolfensis, H. erectus) have their apparent FADs at about this time (Kimbel, 1991; Wood, 1991; Spoor et al., 2007) speaks to an earlier differentiation of the lineage, but other than the Hadar maxilla A.L. 666-1, with an age of ca. 2.3 Ma (Kimbel et al., 1997), the record of specimens bearing on the earliest phases of the lineage's evolution is mostly uninformative. The second reason for our poor comprehension of Homo origins is conceptual. 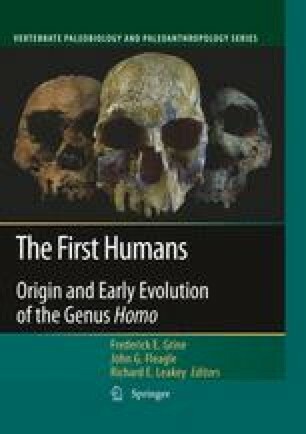 Historically, the search for the origins of Homo has been confl ated with defi ning the morphological and behavioral boundaries between ape and human. In 1871, Darwin postulated an evolutionary scenario linking terrestrial bipedality, canine reduction, tool manufacture, and brain enlargement at the base of the human lineage. When growing knowledge of Australopithecus (including Paranthropus) made it clear by the 1940s that bipedality and canine reduction evolved well before hominins became signifi cantly encephalized and began to leave a record of their lithic technology, large brains and stone tools were elevated to a foun-dational role in the divergence of the Homo lineage from some generalized australopith form. Thus, Oakley's (1959) “Man the Tool-maker” joined Leakey et al. 's (1964) recognition of the “handy man” Homo habilis in framing thinking about the emergence of Homo for the latter half of the twentieth century (Tattersall, 1998).